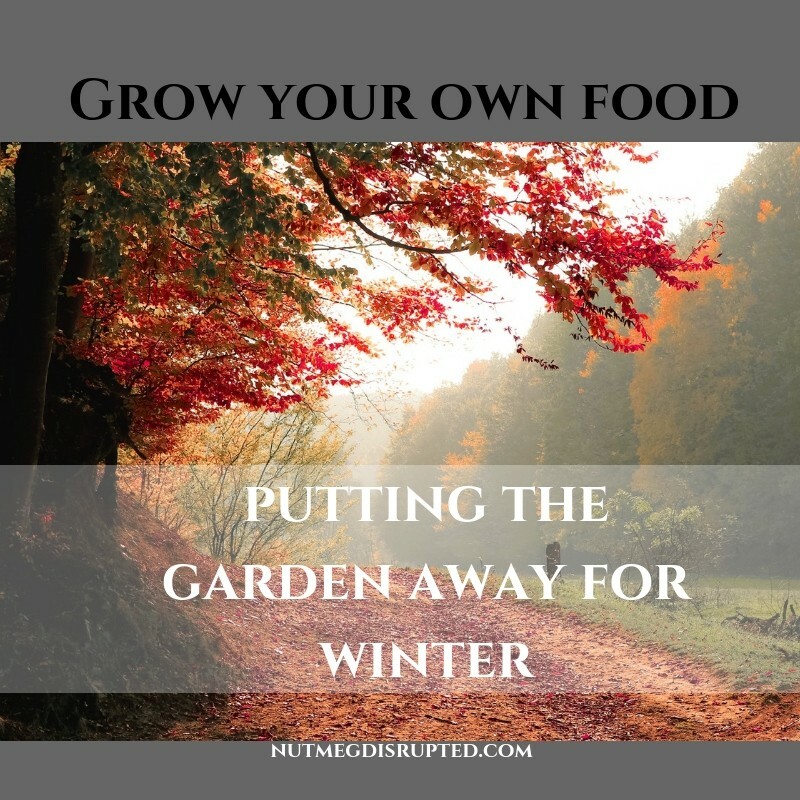 Grow Your Own Food is an information series on gardening in Canada that will get you started and will help you every step of the way to having the garden you dream of. This series was originally written for and published on the Food Bloggers of Canada. 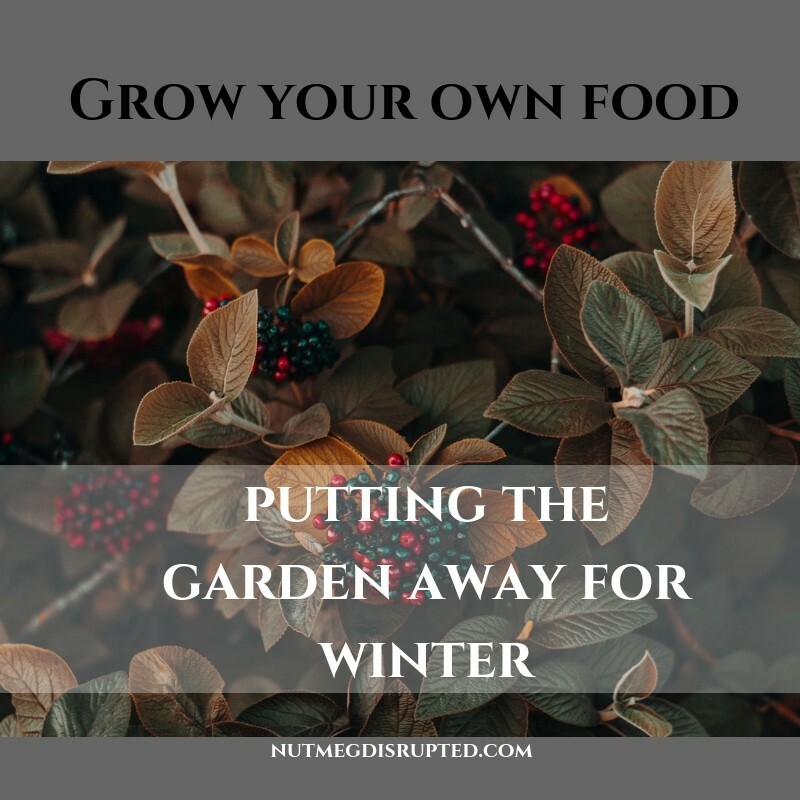 It is now time to complete the harvest for this year and put the garden to bed for the winter. All root vegetables should be pulled and readied for long term storage. I like to use a shovel to dig out my carrots. Often when you try and pull them out by the tops you get a little bit of wiggle then the greens break off leaving the carrot firmly stuck in the ground. After the carrots are pulled I like to give them a rinse with the garden hose to remove most of the dirt. Then they go into the kitchen for a good scrub. Once completely clean I air dry them before packing them into plastic food storage bags and sealed. They are placed into cold storage, either a cold room or into the fridge. They will keep for many months. For harvesting potatoes I like to use a pitch fork or shovel to get them out of the soil. Once harvested they are set on cardboard to dry out. I will brush most of the soil off the surface of the potatoes but I do not wash them. The extra moisture will cause them to go moldy. Once dried they are bagged up in burlap sacks and placed somewhere dark and cool. Potatoes will turn green if they are exposed to too much light so it is very important to keep them someplace dark and cool. It is not advisable to eat green potatoes as they do contain amounts of solanine – a natural toxin they have as a defense against insects, but the levels increase with prolonged exposure to light and warm temperatures. You can often find burlap sacks for sales at some grocery, farm supply or hardware stores. For beets I treat them similar to the potatoes but store them in the fridge. Only a few days of warmth will turn beets soft. Pumpkins can be harvested green, they will turn orange in storage. I place them on a piece of cardboard in the shop/garage and will open the door during the day to expose them to the sun. The warmth will help them ripen. If you are blessed with trees that drop leaves do collect them for your garden or compost. They are a carbon-rich material and are a necessary for a good compost. If you do not compost spread the leaves over the entire surface of the garden. And go heavy with the leaves, you really can’t add too much. We would put upwards of 25 truck loads of leaves into our garden every fall. If you have a large amount of perennials in your garden you may trim some down. I have mentioned before that I will leave some of the taller perennial stocks to dry and remain in the beds over winter. Not only is it a great place for the birds that winter over in your area to perch on while visiting your winter garden it also helps hold snow which is an important insulator for perennial bulbs, especially in the colder gardening zones. If you have not already, do the final grass cutting of the year. For the final cut we like to rise the mower deck to leave the grass fairly tall, about 1 1/2 inches. It is better to leave it a bit taller for winter. If you fertilize your lawn now is the time to give it a low nitrogen, high phosphorus & potassium mix which will encourage root growth. Want to learn more about fertilizer? We discussed commercial and natural fertilizer options and what the numbers mean in the Fertilizer and Composting article in this series. Wrap sun sensitive evergreen shrubs such as Dwarf Alberta Spruce with burlap for protection against winter sun scald. 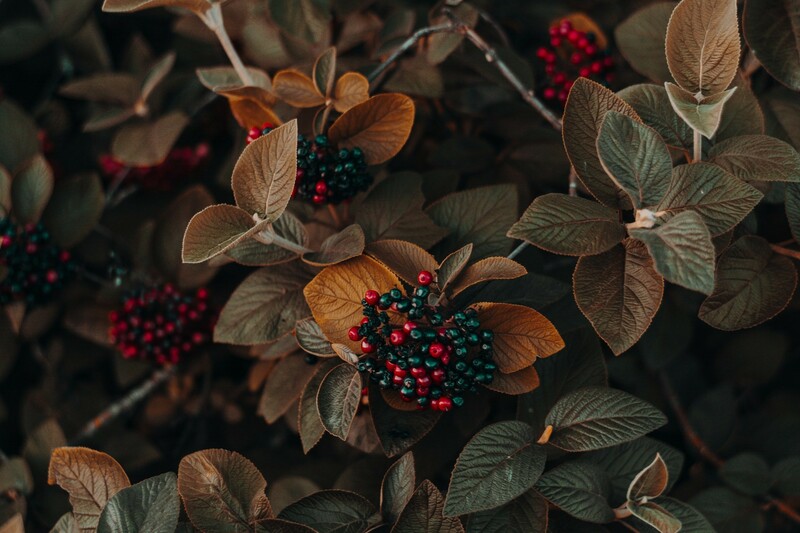 Also if you have tender shrubs close to a roadway that may be treated with salt during winter it is also advisable to wrap them as well to protect them from roadway contaminants. Clean and put away all containers used for planting. It makes for an easy early start in the spring if everything is cleaned and ready to go. All terra cotta containers should be stored in a warmer spot such as a garage or house. They will break in freezing cold temperatures. All garden tools should be cleaned as well. Things like shovels and hoes can be sharpened using a grinder and treated with vegetable or canola oil before storage. There is nothing better then using a freshly sharpened hoe in the spring! With the temperatures cooling it is time to focus on the plants we have inside our homes. As the daylight hours are reduced it is time to cut back on fertilizing house plants and reduce the amount of water they receive. If you have a Christmas Cactus try and trigger it for more blooms. Place it someplace cool and if possible try and put it in the dark for 12 hours a night. This signals the plant to start flowering. Two weeks of giving it 12 hours of light and 12 hours of dark will give you an abundance of flowers heading into the winter season.